Today, Saluda River Club is pleased to shine the spotlight on Andrew White of Lifestone Residential, the superb homebuilder based in Lexington, SC who builds exclusively at Saluda River Club. 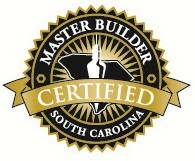 Andrew White is one of South Carolina’s Certified Master Builders, a designation he has held since 2012. To become a Certified Master Builder, Andrew had to qualify through education and other strict requirements, and to maintain the South Carolina Master Builder designation, White must attend at least 10 hours of continuing education classes annually. The Master Builder Program was created by the Home Builders Association of South Carolina as a way to increase the professionalism of home builders in the state and to provide an increased level of protection for consumers. By earning and maintaining this designation, Andrew White and Lifestone Residential have gained a well-deserved place among the best homebuilders in the state. In order to become a Certified Master Builder, White had to meet rigorous guidelines for experience, continuing education, warranties and insurance as well as receive several reference letters from customers and business associates. To learn more about living at Saluda River Club, and about the new homes and home sites currently available in this beautiful community, please schedule a visit soon. For more information or directions, please call 803-358-3969 or visit www.saludariverclub.com.